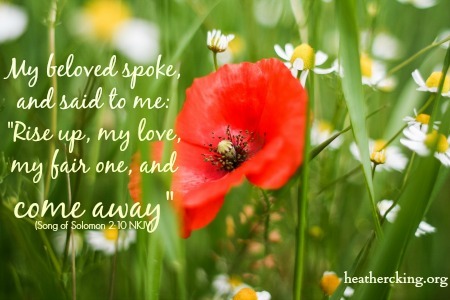 I’ve always needed to retreat spiritually, to run away for an afternoon or spend a weekend away in quiet. I’m an introvert and a workaholic. I’ll fill up every available space in my day with to-do list items and then crash from the emotional overload from the noise. I must get away in order to be healthy: spiritually, emotionally, physically. My sanity and spiritual well-being depend on it. That was true before I had kids. Now I have four little people who don’t fully understand the sacredness of “Mommy Time Out” at the kitchen table with my tea and my Bible. Last Saturday morning, all four of my children needed me for everything and anything nonstop. I probably heard the word “Mom” 200 times in 2 hours, including from one child who thought the best way to get attention was to repetitively say the word, “MOM” over and over and over and over again until it finally floated into my circle of awareness. Mom, mom, mom, mom, mom, mom, mom, mom. A incessant drone of need. Just when I need to retreat the most in life is when it’s hardest to get away. I’m feeling it this week—the crush, the breathlessness, the emotion that gushes out of me at the slightest bump from life and the unexpected and other’s attempts to heft one more load onto my shoulders. of “you must get away even when it’s hard” down on your shoulders. Some of you are single moms or homeschooling moms and I feel so whiny complaining about how hard it is for me when I think of what it costs you to retreat for a few short minutes. Yet, time away with God is what we crave, what our souls need so that we don’t suffocate and die from spiritual dehydration. The truth is some of these ideas will work for you and some won’t. Some you can fit in when school is in session if you don’t home-school. Some of them require effort and help from a spouse or a friend. Treat yourself to a good book. Sometimes I feel guilty reading for fun. Don’t feel guilty. Enjoy a story for a while. Read a book slowly. Choose a book to read just one chapter a day. Let it soak in. Think about what the author is saying or just relax into the story. Discover a new hobby or re-discover an old one: Puzzles, knitting, sewing, crossword puzzles. Create something. Rejoice in our Creator God as you make something beautiful. Unplug from social media. Don’t check your email or Facebook after 8 p.m. perhaps or maybe don’t answer messages after 4 and spend the evening resting with your family and enjoying some time off. Take an afternoon field trip: Visit the library, a museum, botanical garden, the beach, or a bookstore for an afternoon, but go by yourself. Sit and read. Walk a little. Journal some, read some, rest a lot. Early morning cuppa: I’m not one to wake early before my kids. I’m a young mom and sometimes snagging a few more minutes of sleep in the morning is the most spiritual, holy thing I can do. But every so often, an early rise for a quiet time on your back deck before the little ones emerge from their beds is worth it. Mommy time out: When you simply cannot get away, a Mommy Time Out is worth a try. Set the timer in the kitchen and announce that mommy is unavailable for 15 minutes unless there’s an emergency. This takes training! Everything seems like an emergency to a four-year-old. Keep on trying, redirecting and training until your children understand the sacredness of the Mommy Time Out and then treat them to a game of Candy Land or a special snack when they’ve given you the time you need. 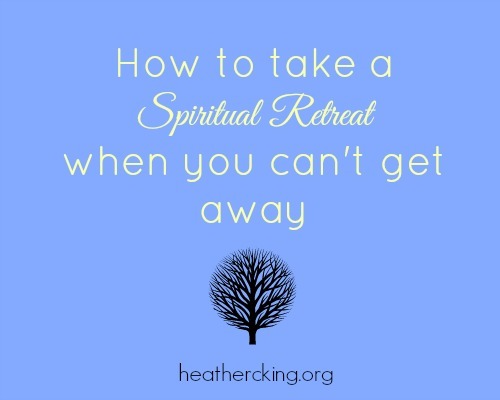 How do you “retreat and refresh?” Do you have any ideas for how to take a spiritual retreat without going away overnight?